We will walk to the 1 Mile marker and back on the bike path. This is a WALKATHON, please no bikes or scooters. Walk begins at 9AM. DON’T MISS THIS FUN & EXCITING OPPORTUNITY TO SUPPORT YOUR SCHOOL! Simply fill in the sponsor pledge forms: It’s easy, easy, EASY! You will be amazed how quickly you will fill a sponsor pledge sheet. Please be sure your sponsor’s names and addresses are complete and easy to read. THINK ZIP CODES! Accurate zip codes will save hours of volunteers’ time. Make sure your name is at the top of the sponsor form. Completed sponsor pledge form can be turned in to the school office or given to student’s teacher on the the turn in date. FOR MORE SPONSOR FORMS, ASK AT THE SCHOOL OFFICE. 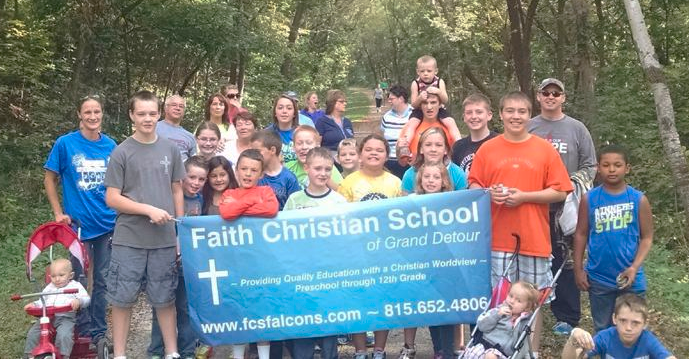 Then, WALK WITH US ON SATURDAY, SEPTEMBER 23RD! Drawing for door prizes at the event! No, you do NOT have to collect the money. If your sponsor would like to pay immediately, that is fine, all other sponsors will receive a billing. Just turn in your Sponsor Pledge Forms to the office and the money will be collected through the mail. If your sponsors want to give you money, please collect it and mark “PAID” next to their name, and then turn the money in with your Sponsor Pledge Forms. Checks should be made payable to FCS. It is only a 2 mile walk so all ages can participate. You will be asking your family and friends to sponsor you with a single, generous, tax deductible gift for your participation in the 2 mile event, instead of being sponsored on a per mile basis. There is no limit and you will be surprised how easy it is! Nine out of ten people will say YES! The more people you ask the more you will help our school. No Problem! Arrangements have been made to walk at the main building in Grand Detour if the weather is poor. Simply ask everyone you know… “Will you sponsor me?” You will be surprised at the number of people who will support you. Read the list below! Mail Out Idea: Use a form letter or a personal letter to invite out-of-town people to sponsor you. Forms are available in the office.